A special place in Krakow’s city center, where you come to expect personalized service, uniquely designed Art-Deco rooms and an atmosphere to let you truly enjoy your special getaway. 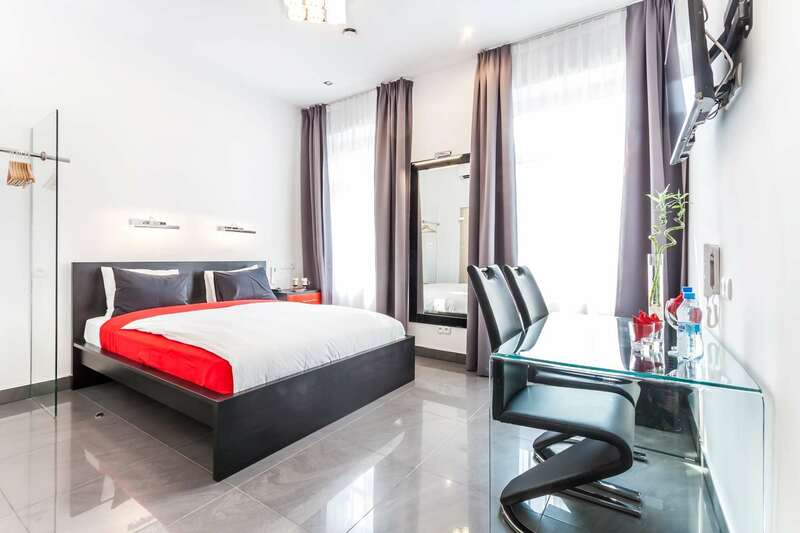 Komorowski Luxury Guest Rooms is an alternative to large chain hotels, offering a combination of high standard accommodation and exceptional customer care. Our enthusiastic team will take care of your every desire and make your stay relaxed and unforgettable. 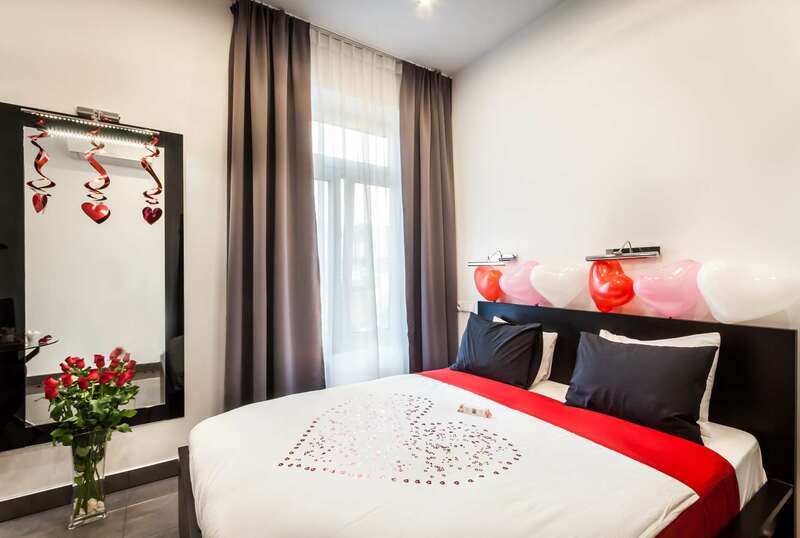 Having in mind couples wishing to spend a romantic getaway in Krakow or surprise their loved ones we have prepared a special Romantic Getaway Packages! A romantic evening in our aparthotel can be a great gift for a wedding, anniversary, birthday and many other occasions that you want to celebrate with your loved one. Warm up in 2-person Jacuzzi! 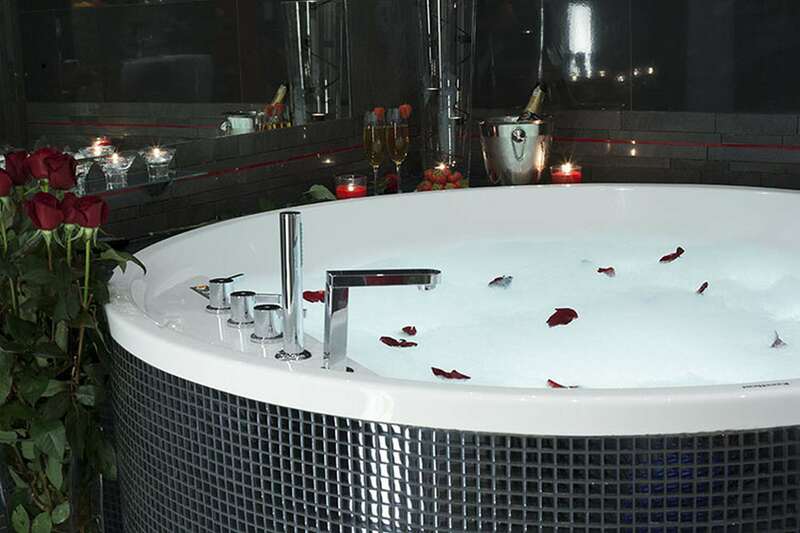 Relax by the accompanying sound of romantic music surrounded only by candle-light and scattered rose petals. It will be the perfect time to ask the question! Komorowski Luxury Guest Rooms will prepare every exact detail so that this special day could be truly unforgettable. We are a designer and boutique accommodation which means that we aim at demanding clients wishing to rest in luxury they have come to expect, but also a unique and intimate atmosphere to make them feel at home during their travels. Each of our rooms is distinctively designed, offering you a different experience every time you stay with us, while maintaining the luxuries you have come to expect. You can expect rooms fully furnished in an Art-Deco style with black, red, and white highlights, king size beds and 40”LCD televisions. Each bathroom also features 1 or 2 person Jacuzzi bath with air and hydro massage, 40” LCD television in the bathroom, 2 person open-concept rainforest shower and in-room waterfall. All rooms have air-conditioning, floor heating and complimentary wi-fi. The combination of history and modernity, as well as the location in the city centre, decides about the unique character of Komorowski Luxury Guest Rooms. Established in 7th century Krakow is now one of the most willingly visited towns in Europe. Located in picturesque region, on the banks of Vistula River, the city enchants tourists every year with its history and thousands of legends. Despite Krakow is not the capital city for almost 500 years, many still consider it as the cultural and artisctic center of Poland. Also 750 years ago in Krakow the first Polish university was founded. The most notable Jagiellonian University graduates are: Nicolas Copernicus, John Paul II and recipient of Nobel Prize in Literature Wisława Szymborska. In the past, Krakow was known as the city of 100 churches. Now, apart from great monuments in the Old Town, you can find over 200 restaurants, bars, clubs, pubs, bistros and cafes. The night life is not only parties. You can also enjoy traditional Polish cuisine, live folk music, theatrical performances, evening strolls in the historic alleys or dishes from around the world. Everyone will surely find something interesting in Krakow! We recently stayed for 3 nights to celebrate wedding anniversary and Birthday. The accommodation and service we received was absolutely fantastic. We have raved about it since we came home and already recommended to friends. We will be returning as had such a wonderful time. Thank you to Paulina and all other staff members for making it a fabulous much deserved break for us. Like last year, my wife and I had a great time in the Komorowski hotel. Will definately return in future. Excellent location – just across from old town, Excellent service, Excellent Room- Very clean and a spa jacuzzi that was perfect after walking old town. I highly recommend this place and definitely would like to return. Absolutely no negatives. We will come back soon. We had the best time in Krakow. We recommend this luxury rooms. The service was great, nice & clean rooms. So nice. You should stay at Komorowski if you are in Krakow. Thank you & we will come back.